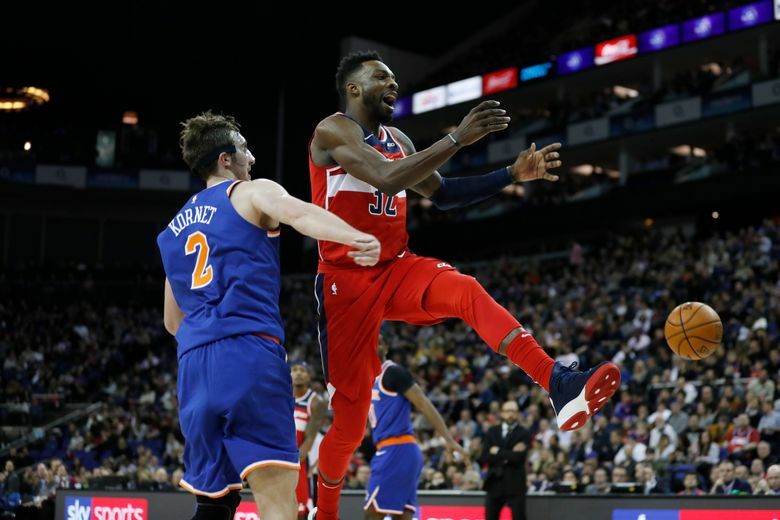 LONDON (AP) — Allonzo Trier goaltended on Thomas Bryant’s layup with 0.4 seconds remaining, giving the Washington Wizards a 101-100 victory over the New York Knicks at The O2 Arena on Thursday night. OKLAHOMA CITY (AP) — Kyle Kuzma scored 32 points to help Los Angeles beat Oklahoma City in overtime without injured LeBron James. The four-time MVP missed his 12th straight game with a left groin strain, but the Lakers still pulled off a solid road win. Ivica Zubac had a career-high 26 points and Lonzo Ball added 18 for the Lakers, who improved to 5-7 without their star. Paul George scored 27 points and Terrance Ferguson added 21 for the Thunder. Russell Westbrook had 26 points, 13 assists and nine rebounds but shot just 7 of 30. Westbrook missed two layups in the final minute but hit three free throws with 2.9 seconds remaining in regulation to tie it. TORONTO (AP) — Pascal Siakam scored basket just before time expired to lift Toronto past Phoenix. INDIANAPOLIS (AP) — Joel Embiid had 22 points, 13 rebounds and eight assists to lead Philadelphia past Indiana for its seventh victory in nine games. DENVER (AP) — Jamal Murray scored 22 of his 25 points in the third quarter, Nikola Jokic finished two rebounds shy of another triple-double and Denver routed Chicago. CHARLOTTE, N.C. (AP) — Kemba Walker scored 23 points, surpassing 11,000 for his career, and Charlotte beat Sacramento.